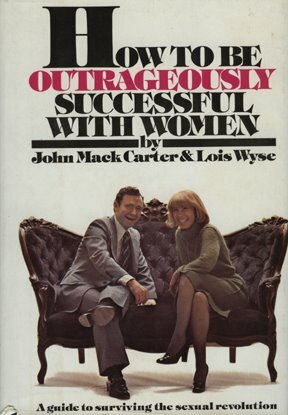 An excerpt from "How to be Outrageously Successful with Women: A Guide to Surviving the Sexual Revolution" by John Mack Carter& Lois Wyse. Published in 1975 by William Morrow and Company. If she married you less than a year ago, you're right. She is your bride. Anything more, and she's your wife. The gray-haired man who peers over his potbelly to introduce "my bride" is not enhancing her role. He is demeaning it. Women have a right to be known as "my wife," and men have no right to treat them like duitifully decorative objects with an insipid introduction like "my bride." Incidentally, that also holds true for men who speak of "the old lady,"* "the little woman," and "my better half." They are all cliches for what these husbands obviously regard as the all-time cliche of their lives: marriage. * Not to be confused with "my old lady," a reference made by unmarried men to the women who live with them.